Life is difficult. Every day each of us must rise and work to carve out a life for ourselves. Though difficult, life is often good. This is especially true when we are surrounded by friends and family. These moments are to be savored because no matter what our position in life, each of us will sooner or later face great sorrow and adversity. It could be the death of a loved one, the loss of a job or home, or some other disaster. In these times, it’s easy to think we are being punished, or that for some reason the universe is conspiring against us. It’s important to remember that not all hardship is punishment. God often sends affliction and trials to purify and strengthen our faith for his glory: “In all this you greatly rejoice, though now for a little while you may have had to suffer grief in all kinds of trials. These have come so that the proven genuineness of your faith- of greater worth than gold which perishes even though refined by fire- may result in praise, glory, and honor when Jesus Christ is revealed” (Peter 1:6-7). At times God will test us with affliction, trials, and discipline so that our faith may be purified. “In the land of Uz there lived a man whose name was Job. This man was blameless and upright; he feared God and shunned evil” (Job 1:1). Job was a righteous man, and the Lord allowed Satan to strike him with grief and affliction in order to demonstrate Job’s great faith. He lost all his possessions, his entire family died, and his body was stricken with painful boils. Despite this, Job did not give up his faith. His wife even tried to convince him to curse God but he would not. Rather, he declared: “The Lord gave and the Lord has taken away; may the name of the Lord be praised” (Job 1:21). The Holy Spirit indeed must have been with Job, where else could he have gotten the strength to endure Satan’s assault? Once it became clear that Job’s faith was stronger than any trial that Satan could muster, God declared that Job had passed the test. He commanded Satan to withdraw, restored Job’s health, and rewarded him with greater riches and family than he had before. God’s righteousness is shown in his treatment of Job. Even though God allowed Satan to take everything from Job, He later rewarded Job greatly for his perseverance. Now, even today the story of Job is an example of how the Lord will never abandon his children. In this life, the Lord will give and the Lord will take away. If like Job we stay faithful no matter what, we will be greatly rewarded in the next life. Christianity is centered around Jesus Christ, who was without sin. Jesus encountered many trials and temptations during his life, and any who have faith in him must also expect to endure trials and tribulations because of that faith. Jesus knew this, which is why he said to his disciples, “If the world hates you, keep in mind that it hated me first. If you belonged to the world, it would love you as its own. As it is, you do not belong to the world, but I have chosen you out of the world. Remember what I told you: ‘A servant is not greater than his master.’ If they persecuted me, they will persecute you also” (John 15.18-20). God blesses those who persevere under trials; we know this because He has revealed it to us in his word: “Blessed is the one who perseveres under trial because, having stood the test, that person will receive the crown of life that the Lord has promised to those who love him” (James 1:12). No one is a stranger to pain, grief, and suffering. The only difference between us is our attitude. The true Christian life follows the narrow path, which is not easy or carefree. The narrow path includes suffering, suffering produces endurance, endurance produces character, and character produces hope (Romans 5:3). Therefore we know we are on the narrow path when we endure suffering, trials, and discipline. Similarly, parents who truly love their children will discipline them. Without discipline, children become spoiled, indignant, and disrespectful. Unless corrected they will grow up to be spoiled, indignant and disrespectful adults, and then the cycle continues. It is the same for us with our heavenly father. When we are rebuked, it is a sign that God loves us. I am currently dealing with many trials lately. A loved one close to passing on, and an upcoming court battle with my child’s father. Reading this was very helpful and inspiring for me. I put my faith in God and hope that I have the strength to see both of these trials through to the end. I am blessed to have a loving and supportive family, friends, and members of the congregation. My only concern is what if a person who says they are Christian beats children due to the adult’s lack of self-restraint or knowledge of right and wrong. Then uses the excuse that they child must obey them and that Jesus will just forgive them anyways for beating the child. That is where I find myself lost when it comes to scripture stating that the child must obey their mother and father. Melissa, I’m glad you found inspiration here and I encourage you to continue to seek the Lord in His word. We should obey our parents, true, but it should be out love and respect for them and for God, not out of fear of abuse. Matthew 7:21 states that not all who say “Lord, Lord,” will enter the kingdom of heaven, but he who does the will of the Lord will enter. It seems to me that someone who calls themselves Christian but then abuses children while expecting to be forgiven is in great spiritual peril. Melissa, I’m so sorry for your struggles and glad to know you have a strong support network to get you through this time. One thought that occurred to me is perhaps you could reframe the court time with your child’s father/abuser as something other than a “battle.” How about, “court-assisted resolution,” or something, to say that you are hoping for the best possible outcome? This is true, he does discipline to make stronger those HE loves the most. I believe in the LORD!! I have found true also that the term Discipline and Abuse have become to some, the same word. This I disagree with! .Abuse is this conversation would be the beating of a child resulting in bruises or broken bones,or hits to the body. This is wrong. My suggestion, if you feel that it is abuse, contact the local law enforcement or Child Protective Services for their definition in your state. I’m so glad I read this , it was so helpful. I’m treated like an outcast by most of my family and friends. They think I’m crazy because I study the Bible every day. But they fail to see the calmness that comes over me to except all I go through on a daily basis. I will never not study or give up on my faith no matter the outcome. Yes my health is bad yes my own children think I’m crazy but Jesus always with me never leaves my heart and walks beside me all the way. Rev. Roy Sr. keep on praying an keep your faith strong god is always their. Thanks, Leks! I appreciate it. Are you positive about that. I applaud your taking responsibility to stop hurting, and I would remind all people we are responsible for some of our suffering and afflictions and God loves us enough to give time to learn the difference. It is true that life itself is full of trials. I believe that God allows us to undertake these trials and gives us the free will to decide how we must handle all of these tests. But God never gives us more than we ourselves can handle. He does give us the choice to ask for His help, and the more we ask of Him, the more He will answer our call. It may not be exactly what we want to hear, but He will answer our cry for help. Some say that which does not kill us makes us stronger. Put your trust in the Lord, His hand will give you comfort and strength. Using Scripture as an excuse to beat up little children is an abomination unto the Lord. May he smite the transgressor unto all eternity. I like the idea of a God being there to Love and support us through the difficult times, but I have a hard time believing that God allows punishment to be inflicted upon his children. I think we choose to punish ourselves for our thinking or deeds, that we are ashamed of, that takes place within our own minds and in the minds of others. The mind is in conflict with itself and spirals out of control until it engulfs everything we hold near and dear and attempts to destroy us. We are powerful beings that can create or destroy ourselves and others. 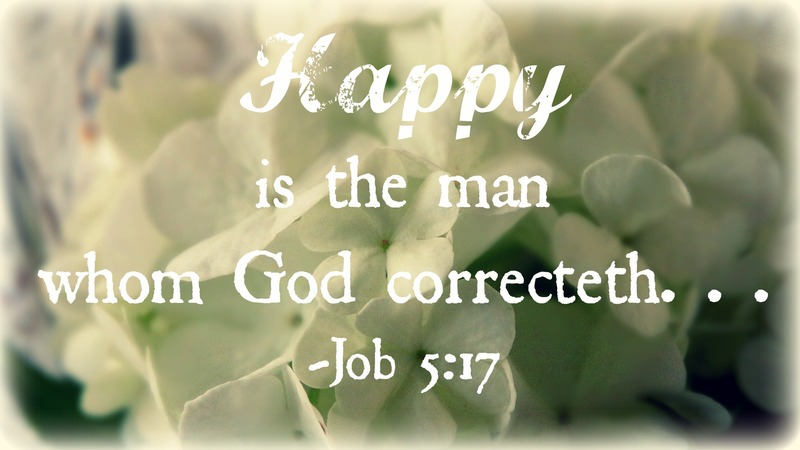 Maybe Job came to a cross road (chose again) where he decided to stop thinking that God was punishing him or even testing his faith and changed course to restore his life. Because he may have come to another realization that God’s love for him was there and would remain there with him throughout the rest of his spiritual life. We have the “Kingdom of Heaven within us” as Jesus said and so why would God want to punish his own kingdom? That would not make any sense. I am currently getting hits from every side. they may seem small to some but I am overwhelmed right now. I keep trying to know…to have my Faith get me through but my mental illness (from a lifetime of sexual mental and physical abuse) keeps telling me to just end it all. This is an Ordeal and I am weakening with each passing minute. I still keep praying in my Way and somehow I MUST get through this!! Lord Give Me Strength!! I would have to say that the verses that have help me through the trials and tribulation throughout my life has been, James chapter 1. I was actually kind of surprised that I didn’t see this verse in the sermon. Hey Ian, I touched on James chapter 1 at the very end of the article. Great article! God is good!